Recently Laura McPhee walked me through her exhibit, River of No Return, at the Kemper Museum of Contemporary Art, Kansas City, MO. We discussed her life and the show's twenty-three mural sized chromogenic prints she photographed over several years in the ranch land and wilderness of central Idaho. Mattie with a Northern Red Shafted Flicker made me a believer immediately. And just as one needs no explanation of the winged goddess, Nike of Samothrace, or a great painting of Joan of Arc, I did not need any back story to love this towering print. The iconic image is resolute....it is enough. But it is no mistake to want story from this work. And that story will take you about as far from postmodern hubris and kitsch as you can get: no air quotes of self-parody, or sardonic hipness here. Naked sincerity is enough. 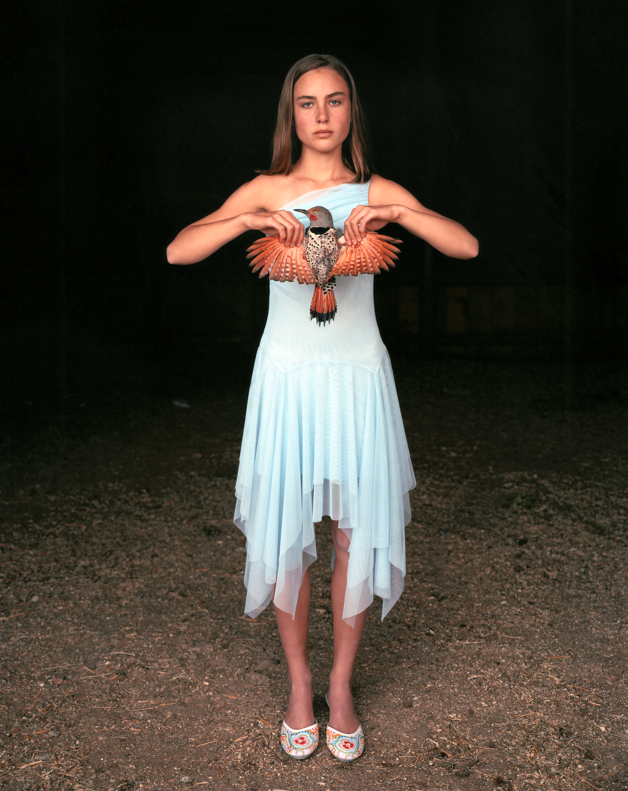 Mattie with a Northern Red Shafted Flicker portrays the extraordinary identity of Mattie, and as Robert Hass so beautifully states in the show's catalog: it is also a "meditation on how we hold the world in our hands." The story of River of No Return is a good one. Laura McPhee goes West from Massachusetts, traces her grandmother's youth and falls in love with ranch land and wilderness and its inhabitants at 7000 feet. When Boston is soaking in June humidity, the Fourth of July Ranch gets a dusting of snow as seen in another print in the exhibit. Ms. McPhee admitted, "Story is first and foremost in my work." And that impulse, it seems, is a family trait. Her father, John McPhee, is a Pulitzer Prize winner and author of thirty-three books. His The Survival of The Bark Canoe is one of the best works in 20th century American literature. Two of Laura McPhee's sisters are novelists as well. Ms. McPhee said she was happy to forgo a writing career -- considering that formidable family shadow - and instead take on narrative with an 8 by 10 Deardorff camera. Yes, that is the large format camera used by the likes of Edward Weston -- the big wooden thing requiring a black cloth, a tripod and 8 by 10 inch sheets of film that slide into the back. 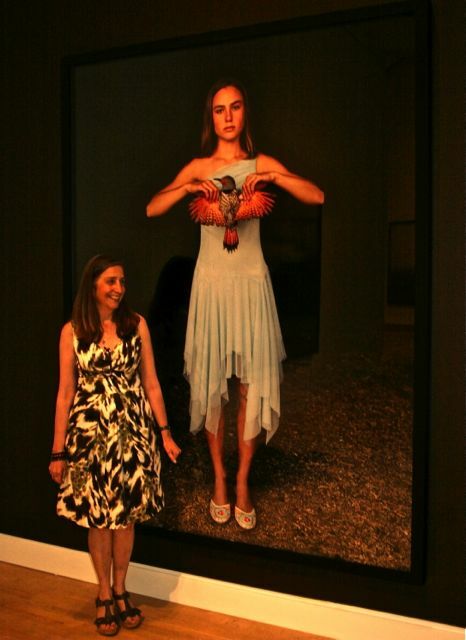 The photographs are so big that, as Ms. McPhee said, "They would not fit into my house." In the last thirty years her work has been collected by a long list of museums including the Metropolitan Museum (New York), the Los Angeles County Museum and the Boston Museum of Fine Arts. When photographed at age thirteen Mattie was living on a high altitude ranch in Idaho's Sawtooth Valley. The nearest town, Stanley, is nestled in a land so rugged that it is one of the only very few areas in the continental U.S. that could support wild grizzly bears, if reintroduced. It is a town with the second coldest climate of all continental U.S. townships. Mattie's parents are wildlife biologists and were ranch caretakers. She was home schooled to avoid the hour-long bus ride (and arduous winter travel) to the nearest public school. Carrying a rifle, riding a horse, hunting game and raising and butchering turkey were routine extracurricular endeavors. 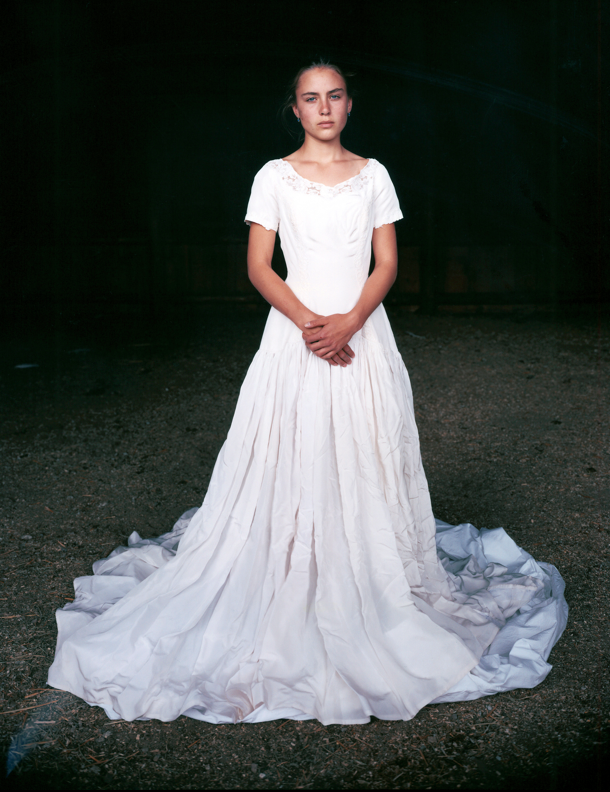 In another portrait, Mattie, for the fun of it, has slipped on her grandmother's wrinkled wedding dress. In this photo, little wounds on Mattie's hands harbor back-stories that feed into U.S. mythology and dreams of the rugged West. These are the hands that touch the tranquilized wild wolves, care for livestock and hold woodpeckers shot for transgressions with wood siding. When standing in front of the actual print, one can see goose bumps on the arms and nicks and scrapes on both hands, little wounds that have bled and become tiny raw beauty marks. The thumb of her left hand has a black spot where it bled under the nail. It all adds up to a bit more micro-trauma than what one might see on a city girl. Add to this a perfect emblem of a maturing teen: "Love" written in a red pen on the right wrist, almost washed away. When Ms. McPhee was granted an Alturas Foundation residency in 2003 and offered a cabin on the Fourth of July Ranch, she made it clear that there might be no photographs made at all. She told me that the lineage of photography in the American West was intimidating (think of a span from Timothy H. O'Sullivan to Ansel Adams). But upon entering the Sawtooth Valley for the first time, she saw a sign marking the Salmon River as Headwaters: River of No Return, and before even taking one photograph, she thought that would be a good name for the series. The game was on. A year later in 2004, she had become acquainted with caretakers on a neighboring ranch: Mattie and her parents. Many of the photographs overlay contentious management issues at play in the American West such as the reintroduction of wolves. In Judy Tracking Radio Collared Wolves, Mattie's mother stands in her backyard with a radio receptor to monitor wolf movement. Strong horizontality in the composition emphasizes the vertical of the figure probing skyward. Facing the light her illuminated translucent nightgown simultaneously renders her as an angel of wolf advocacy and a symbol of the quirkiness and ubiquity of our nature to manage nature. Ms. McPhee told me her favorite book written by her father is The Control of Nature. That would make an apt title for this exhibit as well. Rocks from Sawtooth National Forest speaks to use/preservation issues. Here, granite boulders are being legally harvested from the national forest to use in landscaping. Ms. McPhee remarked that she found this creature parked and could not resist its dinosaur-ness. As a print, it is also irresistible. Beyond the witticism, it is geologic time and story contained, carried in human time. The granite's story is a good one. In the most recent Rocky Mountain uplift, about 60 million years ago, ancient granite (1.7 billion years old) was pushed up and through Cretaceous sedimentary rock, an event contemporaneous with the undoing of the dinosaurs. Newer granite also formed from volcanic episodes in this uplift and years following. The formation of an inland sea and floodplains and then its transformation into the Rockies occurred in a period that John McPhee referred to as the "last three percent of time " in Rising From The Plains. And within that three percent of time we have just arrived, but you'd never know it based on our massive reconfiguring of the planet. Another unforgettable image in the exhibit takes us into the world of a hunt. Quartered Rocky Mountain Elk depicts a legally harvested elk, a way of life for some valley inhabitants. Rendering butchered animals in art has a lineage that goes back to the Pleistocene. And of course it is hard to beat the power in Rembrandt's Slaughtered Ox. To get more current - Sue Coe is an example - contemporary imagery of the slaughter more often speaks solely to the cruelly grotesque. The 1976 documentary film Meat is another disturbing example. But Ms. McPhee delivers a sort of beauty even as the subject may be a turnoff to some. The raw meat forms a red orbit among the white aspens and snow. The green pines survey the scene with a hint of complementary enhancement. Ms. McPhee said that making a photograph of a wild animal butchered like this was a meditation on "the way we think about hunting, what we eat and how that's delivered, in other words the skills it takes to actually feed yourself in the wild." But we also discussed a sort of Kantian dynamic sublime in witnessing, for the first time, a deconstruction of a large animal . I can count on one hand the highly celebrated artists still using large format 8 by 10 inch film. Laura mused that once the movie industry stops using film, film will no longer be made. She remarked, "I hope I will be done as well at that point." Taking in the world on film will soon be a bygone part of the mythology and history of the American West. I cannot imagine a better way to photograph this place and its inhabitants: people who dwell in solitude unfamiliar to most of us, who use techniques of past centuries and who are simultaneously beckoned by the brave new world. River of No Return is an abridged version of the 2006 show at the Museum of Fine Arts, Boston that set an attendance record. If you did not see it then, here is that proverbial second chance. Make the pilgrimage to Kansas City because the art is in the actual c-prints. Laura McPhee's exhibit runs through September 22, 2013. Kudos to the Kemper Museum's Executive Director, Barbara O'Brien, for mounting this extraordinary exhibition.